-Beth Moore, (Reformed Baptist, associated with WoF) Bible teacher, a partner with ecumenist James Robison in TBN. Signed the document called Evangelicals and Catholics Together (ECT). She’s a member of fraternity Chi Omega. Teaches Contemplative /Centering prayer, etc. Practicing Lectio Divina with Reformers John Piper, Louie Giglio, Francis Chan & Reformed Rapper Lacrae at ‘Passion 2012’ (about Lectio Divina). She stated that Jesus showed her the Catholic Church in body of Christ. In a book that she wrote called ‘When Godly People Do Ungodly Things’, pg.109 Moore stated “I have picked up on the terminology of Brother Lawrence. . .’Practicing God’s presence‘. . . .” but she doesn’t mention Brother Lawrence was a Catholic Mystic (Rick Warren also promotes him). She also promotes Brennan Manning in her books, which is another Catholic Mystic. Please check video. -Joel & Victoria Osteen. pastors of Lakewood Church. Joel has said publicly several times that Jesus is not the only way. Joel with Oprah. Joel & Victoria are the spiritual advisors to Bible series produced by Roma Downey & husband. He met with pope Francis in ecumenic meeting and had dinner with some cardenals. -Pat Robertson – CBN, 700 Club. Talking about the pope: “Iam deeply grieved as a great man passes from this world to his much deserved eternal reward. John Paul II has been the most beloved religious leader of our age – far surpassing in popular admiration the leader of any faith..I pray for the cardinals that they might have God-given wisdom in selecting the successor to this great man..” (CBN.com Virginia Beach, VA – April 2, 2005). A member of The Council for National Policy. Robertson prophesied Mormon Mitt Romney would win elections. See some Robertson’s controversies & Operation Blessing. -James Robinson, (WoF) A member of The Council for National Policy. Ecumenical, met with pope. He is associated with many Rev. Moon (Moonies) organizations. –Samuel Rodriguez, Calvinist affiliated with NAR. Ecumenical, Kingdom Culture. Obama’s advisor. Co-founder of the Oak Initiative with Knight of Malta Rick Joyner, was their VP until recently. See videos. President of The National Hispanic Christian Leadership Conference and the Senior Pastor of New Season Christian Worship Center. Here with Pat Robertson. Has worked with Rick Warren, James Robison, T.D.Jakes, Joel Hunter, Bill Johnson, etc. Project advisor for Roma Downey ‘Bible Series’. -Son of God movie, produced by Catholics Roma Downey and husband Mark Burnett. The film retells the life of Jesus and is an adaptation of the ten-hour miniseries The Bible, which aired in March 2013 on the History channel. Diogo Morgado a Catholic and Portuguese actor/model portrays Jesus. Portugal is 98% Catholic country. (The three Portuguese shepherd children, Lucia Santos and her cousins Jacinta and Francisco were the witnesses of what they believed was the Virgin Mary apparitions at Fatima). A Word of caution. Also here. Diego would next April 17 portray the man/devil in the series ‘The Messenger‘ created by Eoghan O’Donnell, also the creator of ‘Awakening’ & ‘Strange Magic’. See more on Roma Downey on pt.1. -TBN, Ecumenical and prosperity gospel tv. station, founder Paul Crouch. -The Bible – Mini series. Who’s Promoting Burnett/Downey’s The Bible? Oprah, Rick Warren, Joel Osteen, Focus on the Family, T.D. Jakes, etc. see more here. –Cindy Trimm, (WoF) Prosperity preacher. Founder of Trimm International, Dominion Ambassadors International, Ga. The Woman’s Healing Clinic, Kingdom Life Publishing and Florida National Community Development. She is also pastor of Embassy Worship Center in Ft. Lauderdale, Florida. She received an award from Billy Graham & are friends with T.D Jakes, Paula White, Juanita Bynum, Rick Warren, etc. She teaches dominionism & about an intergalactic kingdom; New Agers also teach this and they say this kingdom is ruled by their (demonic) ascended masters. One of this ascended master is a fake Jesus called Master Jesus or Sananda that has a helper called Ashtar. Like many of the WoF movement preachers she flashes often the sign of the devil while preaching, some of them are faster than others. She is called an apostle and speaks in many women conferences. –C. Peter Wagner, (NAR) Professor of Fuller seminar, ecumenical & dominionist. He gathered (with Heide Baker) the apostles of NAR (all appointed by him), to support and commission Todd Bentley. He is the founder of the New Apostolic Reformation Movement (NAR). – Rick Warren , Pastor of SaddleBack Church – Ecumenical call. Contemplative Church. Contemplative Leonard Sweet is an emergent leader and frequent speaker in SaddleBack Church. He is working not only to unite Catholics and Evangelicals but also promoting unity with Islam. Their inner healing program is Celebrate Recovery. –Rev. Andrew White, Anglican Archbishop, Mr. White was instrumental in helping draft The First Alexandria Declaration, and also The Baghdad Religious Accord, both of which were “instrumental in bringing together key religious leaders of Christian, Jewish, and Muslim faiths”. According to his web site he is a Knight Templar. He also speaks at Bill Johnson’s Bethel Church. At Signs & Wonders Conference. White is an associate of Benny Hinn, Todd Bentley & Mahesh Chavda. See Bentley, Bonnie & Mahesh Chavda. –Paula White, (WoF) Former Pastor together with ex-husband Randy of ‘Without Walls International Church’. She is now pastor of ‘New Destiny Church’, teaches the prosperity gospel. She stated: “As paul is to Timothy so is T. D. Jakes to me” . 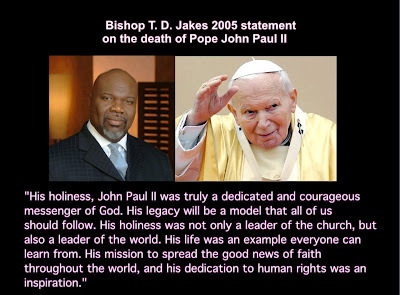 T.D.Jakes is ecumenical & doesn’t believe in the Trinity and said to Oprah that are many paths to God. Paula presenting Mannaseh Jordan as the most accurate prophet. See Mannaseh today, and then his father pastor Bishop Jordan, min. 11:43 & up. receiving blessing and third eye from Hindu priests. With Benny Hinn. Paula just married recently for the third time. Ravi Zacharias – Signed ecumenical document Manhattan declaration & speaks often in Mormon temples and tells them Jesus is preparing a place for them in heaven. Also see The evils of ecumenism. Zacharias considers Catholics followers of Jesus Christ, with some doctrinal differences. He proclaimed Catholic mystic Henri Nowen as one of the greatest Christian saints, he also praises Joyce Meyers, etc. The Vatican is not hiding that they are looking to unite all religion into one, under Roman Catholicism. On Feb. 23/2015: ‘The “ultimate aim” of the ecumenical journey, “is obviously the unity of the churches in the one Church”. “This does not mean uniformity” but “unity in pluriformity”. The “Orthodox Churches should not change much in their internal structure, almost nothing in fact, if they unite themselves with Rome” vaticaninsider. Deception is very subtle. Things are moving very quickly right now, please exercise discernment and more than ever read and study the Word of God. We also need to be careful who we let to lay hands on us. The Kundalini spirit (fire serpent) is real, but is not from God. You will find about it in Yoga, New Age, Hindu religion, Freemasonry, Kabbalah, etc. The spiritual battle between good and evil is real, we pray that our Lord Jesus Christ will give you revelation and understanding of what is going on and that He will protect you and your love ones. As the Holy Spirit leads you please also pray for this ministry, since when exposing evil we become targeted not only by the enemy but also by friendly fire, thank you. Ex-Jesuit, Alberto Series, Pg. 18, 21- 24, 25-28. Does claiming ‘Jesus is God’ make a church or practice Christian?